What happened to the 30 dollar girl? | Normal Is Over. What happened to the 30 dollar girl? You would think that such an important event would lead to us having the pictures of her growing up on our wall, videos of our times together in a shoe box, and mementos to remind us of those early days laying on book shelves. But the 30 dollar girl who prompted us to give away our money, to start Partners and embark on a whole new life; we don’t know where she is, what became of her, or even a photo that we know is of her. But I do remember some things. I have many pictures like this one that a friend from Australia sent me yesterday. She was on a trip to visit Rose's home in the early days with us and kept this picture in her photo album from the trip. The girl in the front with a blue T shirt with Micky Mouse on it is Naw Mu Kapaw, the girl who was found by soldiers sleeping in a pig pen. The 30 dollar girl is most likely one of the children in this picture. She was in many of our group pictures. I say group because as soon as we said yes to support her, Rose said yes to others like her. Within the space of a month she had 4 children living with her. Within a year the number was up around 30. 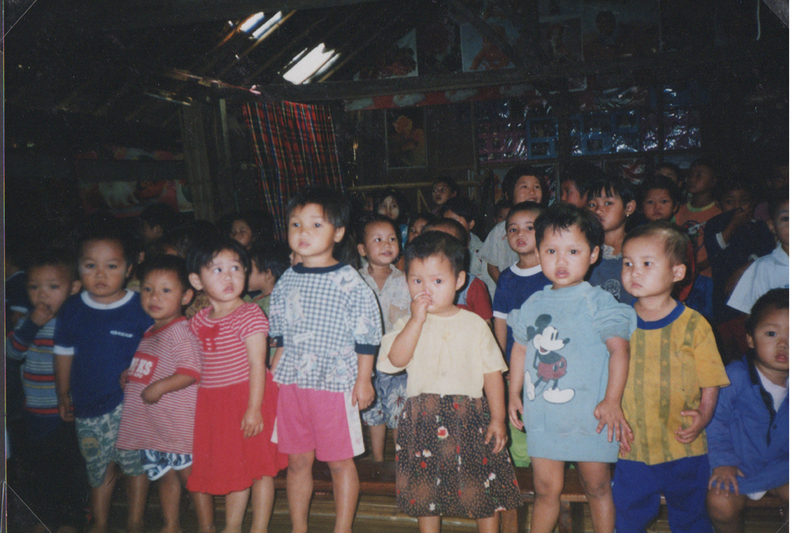 Rose quickly became mom to many the children who were lost, orphaned, or otherwise marginalized by the war in Burma. This happened because Rose said yes. And we said yes. So Oddny and I did everything we could to keep up with the rapidly growing need for sustenance for these vulnerable children. I know that Our Girl is in some of our many group photos, but I don’t know which one she is. I remember Saw Brown, a 5 year old boy whose mom and dad were executed in front of him. He lived with Rose for many years before one of his uncles found out he was living with her, trekked through Karen State, and embraced him back into the family. Saw brown and I used to play football when Oddny and I visited the camp. I remember Naw Mu Kapaw who was found sleeping in a pig-pen. Her story is confusing but she was malnourished, filthy, and traumatized when she arrived at Rose’s home. She wouldn’t talk for about a year and had many behavioral problems. But eventually under Rose’s care, she became a healthy chatterbox and dresser-upper as any young child who wants to be a princess is. The story happened as I told it to the best of my memory. All of the facts are certain, but the details of that first little girl are lost in a tidal wave of other children and circumstances. The 30 dollar girl is important to me. She was God’s voice to me, encouraging me to live for something bigger than myself. She was the seed that started Partners Relief & Development. I’m grateful to have known her and often pray for her still.